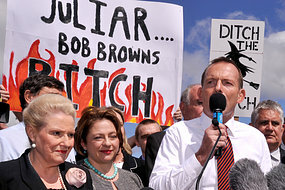 It was hard not to be appalled by Abbott's performance yesterday. He chose his company deliberately. That included the other speakers. Barnaby Joyce was playing hysterical demagogue. Archibald is from the mining industry and close to the Lavoisier Group of deniers, founded by that well known friend of working people and the environment Hugh Morgan. Doubtless many in the Canberra crowd were small business people with close links to the Liberal Party. Prof. Karoly said. "If climate change is happening, it's happening on top of - and as well as – all the natural climate variations." "Better to ask", Prof. Karoly said, "is how much worse were the floods made by greenhouse climate change?" While much more research needs to be done, his 'best estimate' is that the floods were perhaps 20% worse than if carbon dioxide levels had remained at the levels of about 100 years ago. While that may seem only a modest addition, Prof. Karoly said the shift to a warmer climate – signalled too in record seawater temperatures around much of Australia - means Australians had better prepare for a land of greater droughts during the dry spells and worse flooding rains in the wet ones.David Karoly + Simon McKeon @ Firbank Grammar. 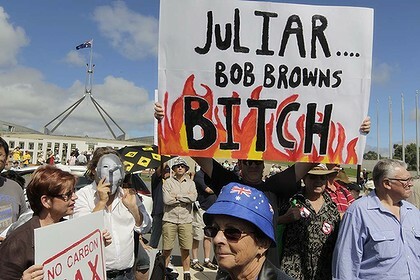 The anti-carbon-tax lobby is well organised and presumably well financed. Menzies House provides many of the links to the people's revolt on their campaign website Stop Gillard's Climate Tax. It was always going to be a dirty fight. Pug politics!